Carpet installation is deceiving. On the face of it, it looks no more difficult than rolling out the carpet and tacking it down. But there is a good reason why professional carpet installers exist. If you’re installing your own carpet, here are a few tips to help you preserve your sanity. You Can't Just Use Regular Shop Tools. You'll Need to Rent Special Ones. Some tools will be regular “shop” tools: tape, hammer, tin-snips, scissors, snap-line, utility knife, and a stapler. The other carpet-specific tools should be rented or borrowed, such as a seam iron, power stretcher, and knee kicker. It is far too expensive to purchase these tools and use them only one time. You can try, but the results will look terrible. Wrinkles and lumps will quickly form. 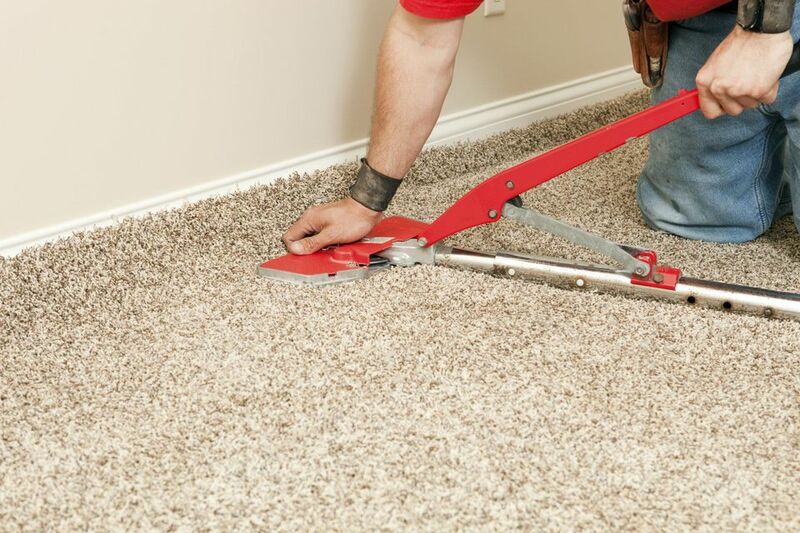 If you are not prepared to take on a carpet stretcher, you may want to think about hiring carpet installers. Stretching is 90% of the job, and good carpet installers know how to do this. Obviously, if your carpet has a pattern you cannot seam two pieces in any combination. But even for non-patterned carpeting, you can detect the direction of the carpet’s pile by looking at it from different directions in strong light. Keep carpet pile consistent from piece to piece. The temptation is to shove the carpet tack strips (alternately called tackless strips) all the way against the wall or baseboard. Don’t do this. You will need the extra space in order to squeeze the carpet through. Guesstimate the gap this way: you want the thickness of the carpeting, but just a hair less. If it’s the exact thickness of the carpet, the carpet may pull out. But by making the gap a bit narrower than the thickness of the carpet, the carpet snugs in there nice and tight. You will experience more waste materials with patterned carpet than with non-patterned carpet. This is because you need to cut away more waste material to make two pieces of patterned carpet mate together. The larger the pattern, too, the more waste you will have. OK, this is not so much a “tip” as it is a hard-and-fast rule. You do not lay the padding over the tackless strips. Keep the padding within the perimeter formed by the strips. Padding should touch the edge of the tackless strips, but not overlap it. If the padding overlaps, then you’ll have a nice, fat lump around the edge of your carpet—not very attractive.